It’s here! 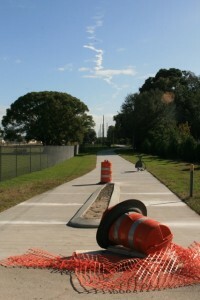 The much anticipated (by me, anyway) Cady Way extension connecting Cady Way and Audubon Park to Coytown and Lake Druid Park (mountain bike park and community garden). 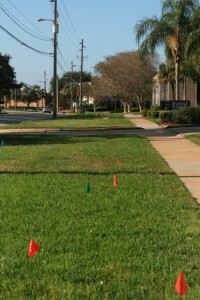 The cones are still there, but the concrete is dry and people are already using it. 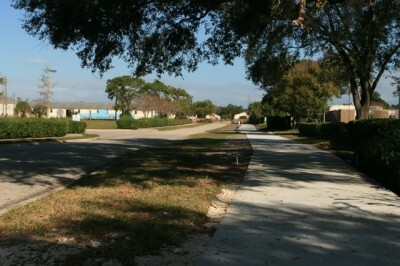 Here are some photos, starting from the East end at Warehouse Rd. Looking West from Warehouse Rd. I LOVE, LOVE, LOVE this! This is a connection to Primrose. This will change my route for a number of common trips, especially at high-traffic times. 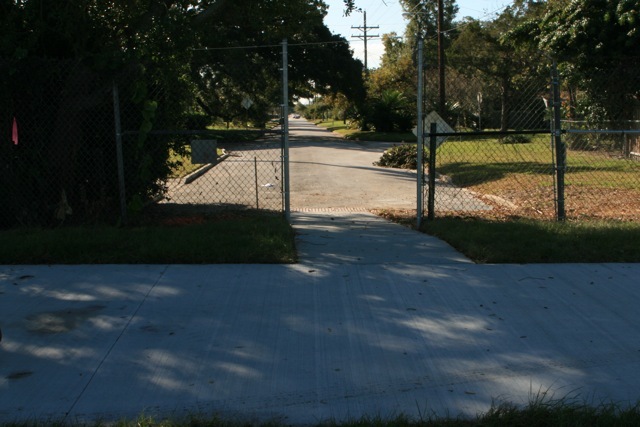 Here’s the West end, looking toward the Lake Druid Park entrance at the end of Coy St. Looking back to the East (right). I like that the city has chosen to use the medians rather than bollards. Check out the contrail in the sky. Turns out, this is also a good place to watch a rocket launch (which happened behind my back when I was riding west). There is more to this project. The city has added an enormous sidewalk along Maguire Blvd. and Warehouse Rd. This will be great for rollerbladers, wheelchair users and people pushing strollers to connect to Cady Way and the mall. 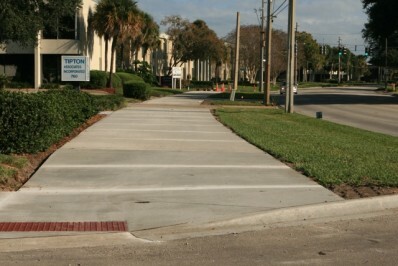 I hope there is a plan to add good, marked and signalized crosswalks to get across Maguire from this deluxe sidewalk. Right now there is only one crosswalk at the main mall entrance and it has an unreasonably long delay if you don’t catch it at the right point in the cycle. The mall entrance does not line up with any of the roads, so it is not a convenient place to cross if you are coming from Executive Center, Lawton or Woodcock (where there are no marked crosswalks). There are also no sidewalks on Woodcock or Lawton (people walk in the gutter and wait at the Lynx stops in the grass). 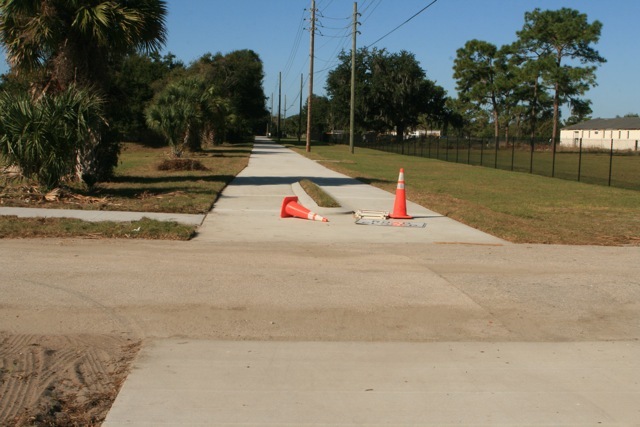 But the city’s sidewalk improvement project is underway! 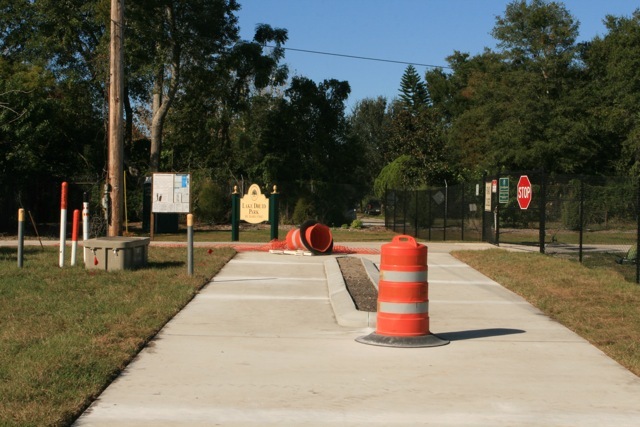 I saw new sidewalks being installed in Audubon Park last week and I was very excited to see a new sidewalk under construction on Executive Center Dr. (right). Thank you Orlando! This makes a big difference for us! We were out on the tandem on Black Friday not, I repeat, not shopping and this new connection was brought to our attention by a resident who lives in the neighborhood at the far north end of Primrose. We were cutting through the Target parking lot. I guess we won’t have to do that anymore!!! YAY!! You rode through the Target parking lot on Black Friday? You’re way braver than I’ll ever be. I use Colonial. Much safer than that parking lot any day. They already started peeling away the grass on the mall side of Maguire. I saw it this morning while jogging. It’s parallel to the existing sidewalk, which I wonder if they’re keeping (parts of it are uprooted by trees and probably need replacement). It would be nice if they widened it up to and across 50, and then connect it to the path already there that starts at the executive airport. The Fairgreen path looks awesome too. Can’t wait for that to get done. It looks like a better way to get across 50 too. Sidewalks are really needed on Lawton and Woodcock. I see plenty of people using those bus lines, especially now that the INS office is there. Hey! How come you guys get to have all the connectivity fun? 🙂 That’s great for you guys. Do you really think that concrete along Maguire is for “wide sidewalks”? LAB points are not earned by helping in-line skaters. I know exactly what it was intended for. The city is still stuck in the mode of treating bicyclists like Pedestrians on Wheels (POWs). I have no intention of using it that way nor would I recommend it. It’s a very nice sidewalk for pedestrians. Doesn’t anyone realize that they are “feeding the beast” when they overuse stop signs? The complaint is that cyclists ignore stop signs, then they put them every 100 feet on a sidepath. Agreed! I don’t know what the deal is with that. Though I think the planned “bike route” is for cyclists to use Illinois St. Apparently. Which is silly, since it then heads back north on Fern Creek to Lake Highland. It’s good to see the city making such improvements. Hah, nice picture of the Atlas 5 rocket!